This is not a traditional "lasagna" recipe. Don't look for pasta listed as an ingredient. The "lasagna" in this recipe are roasted pumpkin slices! Using creative ingredients to make a "lasagna" that's lighter (and easier to make) than the traditional Italian version has inspired me to start a "Lasagna Series", experimenting with other layered combinations. Look for recipes in this Series over the coming months! We served this dish immediately from the oven and we had the leftovers the next day. It's tastier served the next day, after the pumpkin has absorbed the tomato, walnut and cheese flavors and the layers have had time to set after baking. Cut the pumpkin in half lengthwise and remove the seeds and stringy center. Place the cut side down on a flat roasting pan that has been covered with parchment paper or aluminum foil. Roast in a 350� oven for 45-60 minutes. Remove from the oven and turn the halves over to allow steam to escape. When cool, carefully remove the outer skin and cut each half into several 1/2" slices. In a food processor, pulverize the bread cubes to make crumbs. Add the parsley and garlic cloves and continue to process until even in texture. Toast walnuts on a flat baking sheet in a 400� oven until golden brown. Watch closely, as they will burn quickly. Remove sausage meat from the casing and saut� until brown. Break up large pieces. Oil a deep, straight-sided gratin dish. Arrange an even layer of pumpkin slices in the gratin dish, closely fitted to cover the bottom. Over the pumpkin layer spread a few TBS cooked sausage meat (optional), about 1/2 cup tomato sauce, a few TBS of seasoned breadcrumbs, and the same amount of grated cheese and toasted walnuts. Add another layer of pumpkin and the same sequence of other ingredients. Proceed to build the layers until all the ingredients have been used up. 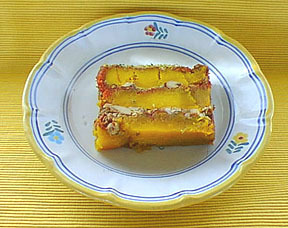 (A typical gratin dish should hold 3 layers of pumpkin). End with a topping of seasoned breadcrumbs. Bake in a 350� oven for about 45 minutes. The "lasagna" can be served immediately, but for better flavor, cool the cooked "lasagna" and refrigerate it overnight. Serve reheated the next day. Served with a tossed green salad and a hearty burgundy. 1/2" slices: Try to keep the slices intact. But don't worry if they fall apart a bit. They won't be seen in the final assembly. Gratin Dish: I used an oval dish about 8" (l) x 4"(w) x 4"(h). This will allow for 3 layers of pumpkin. A rectangular dish about the same size would give pretty cross-section slices (as pictured).